In a company memo circulated yesterday, Amgen CEO Robert Bradway said the firm will begin reconsolidating oncology operations into its Thousand Oaks headquarters. Thousand Oaks-based biotech firm Amgen announced it will shutter the San Francisco facilities once belonging to Onyx Pharmaceutical, a company it purchased in 2013, and lay off 300 employees there. 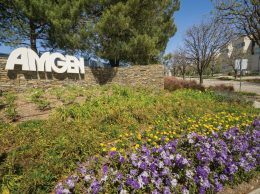 In a company memo circulated yesterday, Amgen CEO Robert Bradway said the firm will begin reconsolidating oncology operations into its Thousand Oaks headquarters. The news comes on the heels of the U.S. Food and Drug Administration’s first biosimilar drug approval, a cancer treatment that will compete with Amgen’s Neupogen for patients. Onyx’s 250 sales and medical staff members will be given the option of continuing their work with Amgen. After layoffs and transfers, some 200 of Onyx’s 750 employees are still unaccounted for. Bradway said the firm will notify all employees of their longer-term employment status by late April and will not execute layoffs until the beginning of 2016. Correction, March 10 at 3:00 p.m.: A previous version of this article stated that Onyx’s 250 sales and medical staff members, or field staff, will be transferred to Thousand Oaks. However, so far the company has only determined that it will extend those 250 employees the option to remain with the company; where they will be located has yet to be decided.